As one of the most visited vacation destinations in the Ozarks, Branson not only offers great shopping opportunities but it’s also a place where you can find a wide selection of specialty restaurants. Some of the restaurants in Branson include fine dining, seafood and family restaurants, steakhouse, as well as eclectic eateries, chains, breakfast restaurants, fast food, buffets and banquet facilities capable of seating hundreds of guests for conferences, meetings, weddings, reunions, and other special events. With over 300 restaurants in Branson, this favorite family vacation destination in the Midwest is full of delicious dining options that can make it challenging in choosing the best. 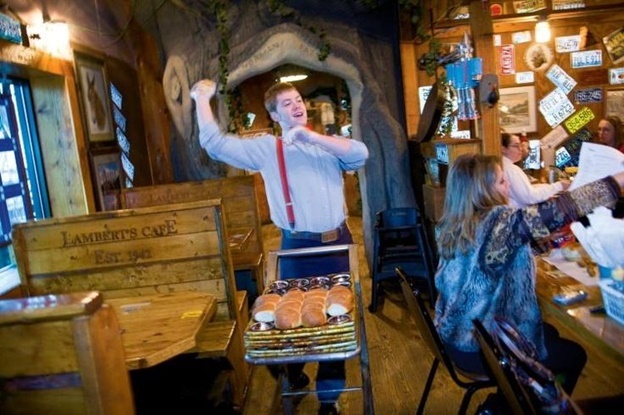 Whether you want a hearty meal or to energize before hitting the town for an evening show, here are some specialty restaurants in Branson to help you find tasty food and have a memorable dining experience during your stay. Some of these specialty restaurants include Billy Gail’s Café, Black Oak Grill, Osage Restaurant & Buffalo Bar, and Lambert’s Café. Located west of Branson, Billy Gail’s Café which is housed in a hillbilly-chic log cabin offers heaping portions of breakfast or lunch. Try their tasty omelets that are made with four eggs and pancakes that overflow on the plates. If you find it hard which one to select, try the Sloppy Biscuit (a biscuit heaped with cheese, sausage and an egg smothered with country gravy). Billy Gail’s doesn’t take credit cards, so if you don’t want to end up washing dishes for the day, make sure that you have cash on hand. Black Oak Grill is a nice restaurant in Branson which features patio and window views of Lake Taneycomo. Try the restaurant’s signature Black Oak Punch, a combination of Bacardi rum, Asti Spumante, and ginger ale with a splash of cream. The restaurant also offers other great menu items that include fried goat cheese, grilled meatloaf and Dino’s 24 Karrot cake. The Osage Restaurant & Buffalo Bar is located at the highest elevation in Taney County with splendid views of the surrounding landscape of the Ozark mountains. The on-site rotisserie restaurant is responsible for the tasty Signature Rotisserie Roasted All Natural Chicken. Arnie’s Barn is another on-site restaurant which is open for both lunch and dinner which uses its own rotisserie and wood oven to delight guests with its Southwestern-themed menu. If you come near U.S. State Highway 65, don’t miss to visit Lambert’s Café. As soon as you’re seated, pay attention as you’re likely to be popped on the side of the head with a big hot yeasty dinner roll. Claimed by Lambert as “The Only Home of Throwed Rolls,” the restaurant bakes thousands of rolls fresh throughout the day. The café is also known for its southern cooking: chicken and dumplings, fried catfish, fried chicken, hog jowl and fried bologna. So, if you are visiting Branson any time soon, try to find a specialty restaurant where you can have a memorable dining experience with your favorite food.